Microlit Flexinozzle Smart And Sophisticated Flexible Delivery Nozzle Research Innovation. Microlit Flexinozzle Smart And Sophisticated Flexible Delivery Nozzle Research Innovation. When it comes to working in real laboratory environments, users often find themselves dealing with issues of space. Consequently, working efficiently and pouring reagents into different types of vessels/reservoirs in such conditions becomes a tedious job, owing to the fixed delivery nozzles in conventionally available Bottle Top Dispensers. Fixed/rigid delivery nozzles in conventional Bottle Top Dispensers make it extremely difficult to fill long vessels as the dispenser either has to be tilted or placed on a raised platform to carry out any operations. Tilting the dispenser can cause spillage or accident. This reintroduces the danger which the dispenser is designed to eliminate in the first place. Placing the dispenser on a raised platform requires more effort and reflects poor ergonomics. This option might not be even available in a lot of labs. After comprehensive analysis of the collected data and customer feedback, our R&D team has designed and developed the FlexiNozzle TM – a smart and sophisticated flexible delivery nozzle. 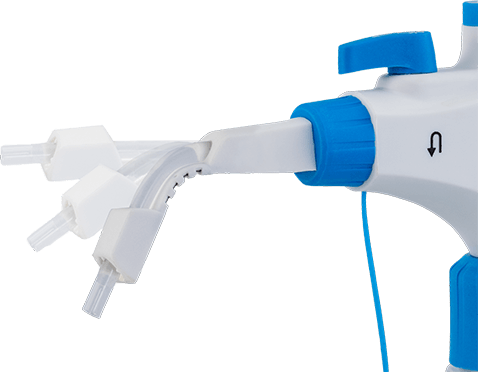 FlexiNozzle TM is an innovative yet simple solution – it allows users to change the angle of the delivery nozzle while carrying out routine laboratory operations. Thus, they can comfortably work with a variety of differently shaped and sized vessels like test tubes, conical flasks and measuring cylinders, that otherwise are difficult to access with a perpendicularly placed nozzle.